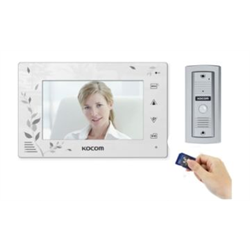 This expandable video door intercom system from Kocom not only lets you see who is at the door but also records images on the built-in SD recorder so it's perfect to keep an eye on the front door when no-one is at home. The recorder automatically activates whenever there is motion in the camera view so there's no need to be there to initiate recording, and you can review footage as needed. Recording is made to the included 4GB SD card and up to 16GB cards are supported. This intercom is perfect for home or small business and includes a slim surface mount door station with pinhole camera and a 7 inch LCD hands free audio/video inside station. The system can be expanded up to 4 indoor stations and up to 2 outdoor stations using standard 4 wire connections. For additional indoor stations use KCV-D374 stations. The weatherproof outside door station has a built-in pinhole colour video camera. When the door bell button is pressed, the inside station will play a chime to alert the occupants. An optional door strike can be added to allow the occupant to remotely unlock the door from any inside intercom station. 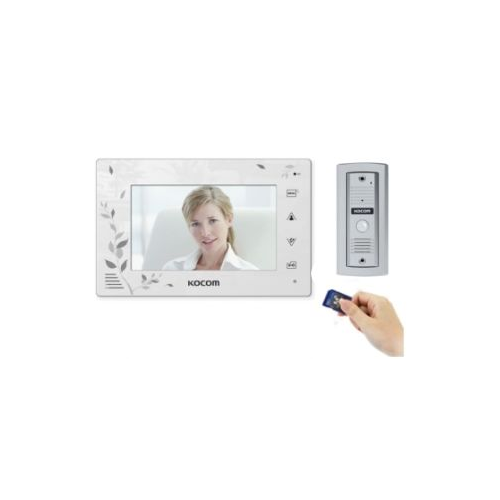 The inside door station features a bright 7" LCD video display with on screen functions.